The CTV Series is a highly adaptable cargo platform, allowing everything from fuel resupply to construction. The modular nature of the CTV allows any module between the guidance unit and the service module to be interchanged for the needs of the mission. This version is the enhanced model, with a larger service module and a different cargo module. This configuration is perfect for resupplying stations orbiting the Mun or Minmus with lander propellant and changing out science containers to be processed. 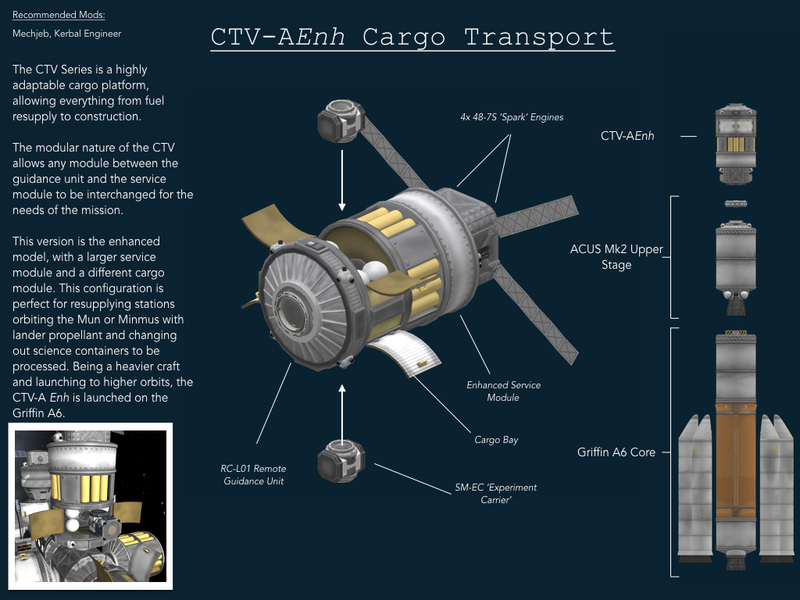 Being a heavier craft and launching to higher orbits, the CTV-A Enh is launched on the Griffin A6. A stock rocket called CTV-A Enh. Built with 200 of the finest parts, its root part is probeStackLarge.